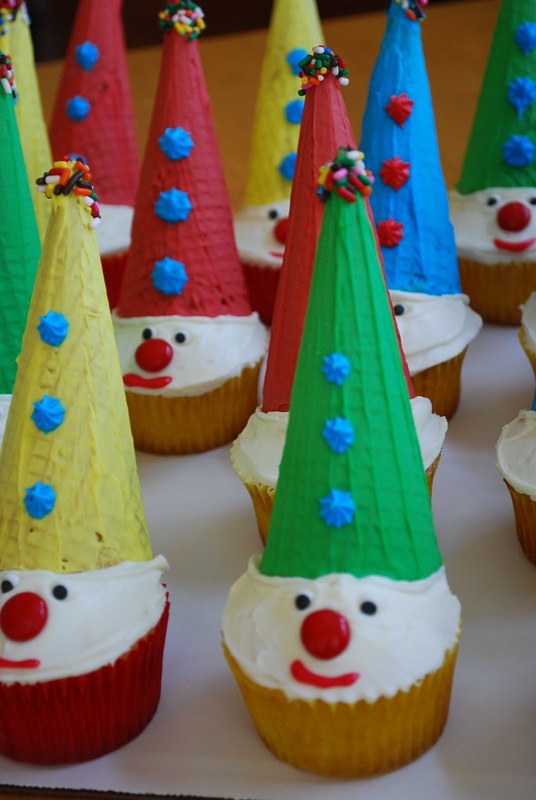 Carnival Clown Cupcakes are a fun cupcake recipe project for kids to make and eat! First of all, I would like to start off this post with a disclaimer: In no way do I claim to be an experienced or professional cake decorator! I am perfectly happy with the title of “Fun Mom” and the squeals of delight from my kids when they see my creations. Even though this is primarily a healthy recipe website, I feel that my kids should enjoy fun and indulgent treats in moderation. After all, that’s part of the fun of being a kid! 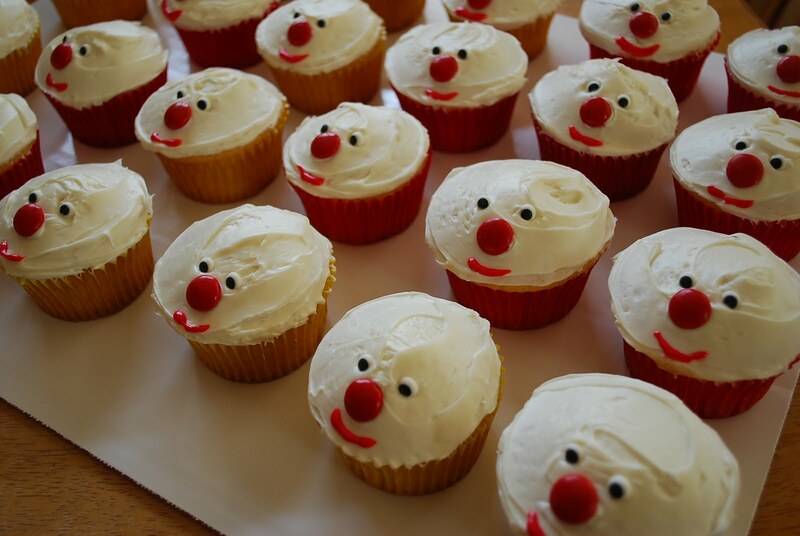 I baked these Carnival Clown Cupcakes as a treat for my daughter’s spelling carnival at school. I get most of my cake and cupcake ideas from local bakeries and online at websites like Taste of Home (where I got the basic idea for this cupcake) and Family Fun. There are so many great websites for cool and crazy baking ideas for kids. These cupcakes were fun to make and my kids loved “painting” the sugar ice cream cones with colored frosting. Prepare 4 bowls of frosting using one and half cans frosting or about 1/2 cup buttercream in each bowl. Add enough food color gel, in each bowl, to achieve a rich color and stir. Pour sprinkles in a small bowl and set aside. 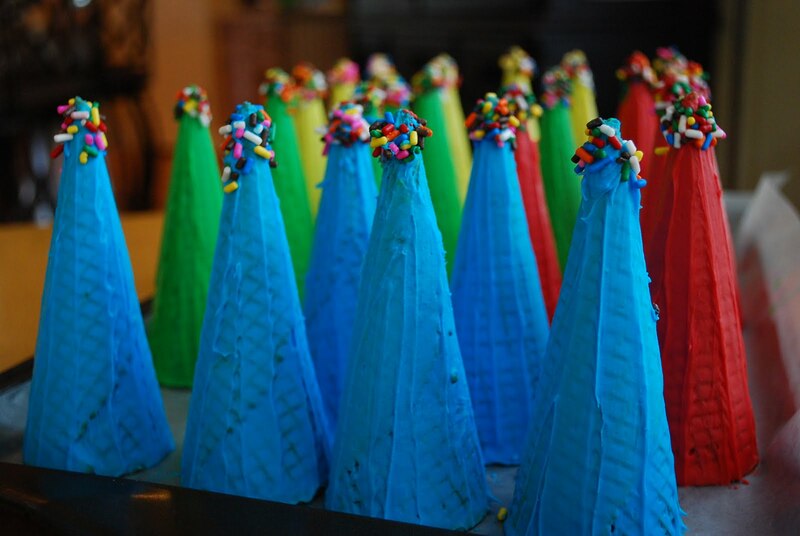 Using a knife or pastry brush, coat each sugar cone with icing and smooth out with finger. Put a dollop of icing on the end and dip the end into the sprinkles. You will end up with 6 cones of each color. Set aside and allow to thoroughly dry. After cupcakes are completely cooled, frost and add eyes, a red M&M nose and (using some of the red icing from frosting the cones) draw a small mouth. Place the leftover icing in a quart size ziploc bag and snip off the end. Pipe icing around the bottom rim of the sugar cone. Place “hat” on the cupcake and lightly press into the frosting. 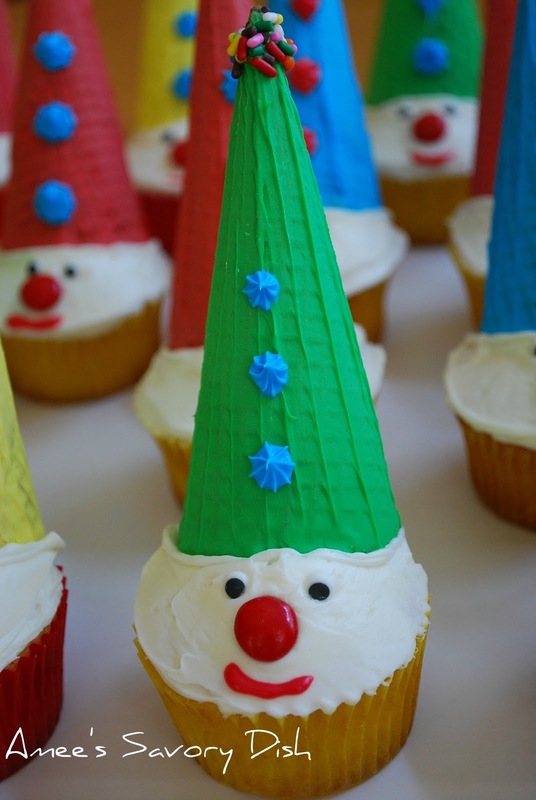 Decorate with remaining frosting using your favorite tip (I used the small star tip on the hats). Prepare 4 bowls of frosting using one and half cans frosting (or about 1/2 cup buttercream) in each bowl. Add enough food color gel in each bowl to achieve a rich color and stir. Pour sprinkles into a small bowl and set aside. 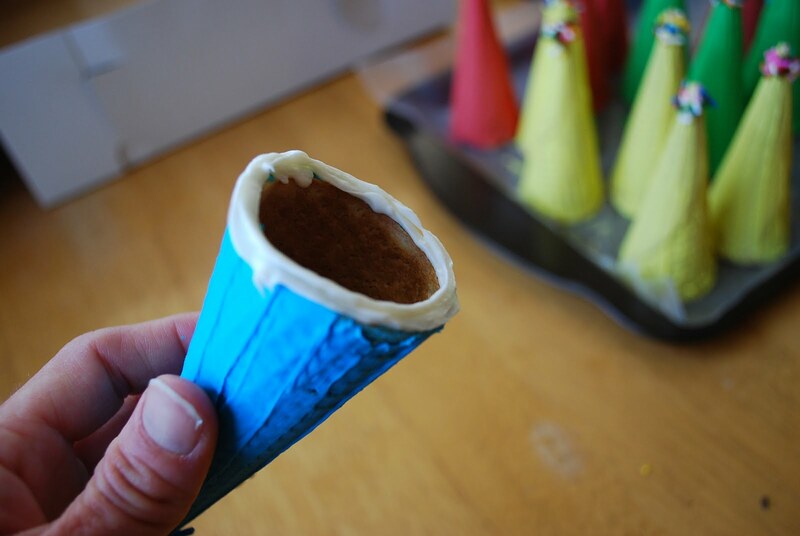 Using a knife or pastry brush, coat each sugar cone with icing and smooth out with finger. Put a dollop of icing on the tip end of each cone and dip the end into the sprinkles. You will end up with 6 cones of each color. Set aside and allow to thoroughly dry. After cupcakes are completely cool, frost and add eyes, a red M&M nose and (using some of the red icing from frosting the cones) draw a small mouth. Place remaining icing in a quart size ziploc bag and snip off one corner. Pipe icing around the bottom rim of each sugar cone. 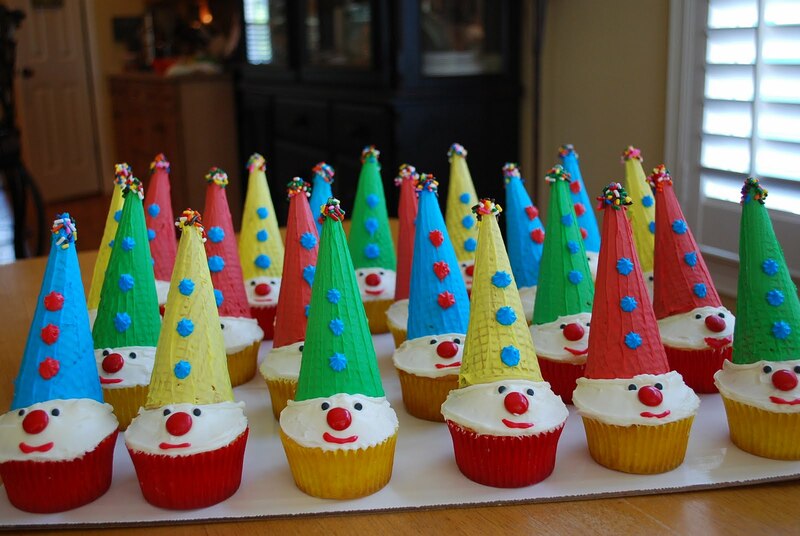 Cupcakes whimsically decorated to look like carnival clowns. *Helpful hint: Assemble the cupcakes the same day that you plan on serving them. If the cones get soft, they tend to crack. You can decorate the faces and the cones the day before serving and place the “hats” on as the last step. This way, they stay perfect! Oh.My.Goodnes! These are just adorable! You did a fine job “Fun Mom”….I’m sure your kids are the proudest ones at school. I love kid-friendly ideas like this. SO glad you shared! These are so cute!! I used to love making fun treats for my kids classes but up here in MN everything has to be store bought for safety reasons…. I know the kids loved the cupcakes!! I am hosting an ice cream social this weekend. I hope you will join us. Adorable and perfect for a child’s birthday party! Amee- These are so cute I can hardly stand it!! Love everything about them…especially the multicolored cones. And super cute sprinkles on the tops! They’re fantastic! Thank you bunches for linking up with Mop It Up Mondays at ishouldbemoppingthefloor. So happy you could stop by! Me again! I just can’t quit thinking of all of the adorableness of these. I featured you on this week’s Mop It Up Mondays: http://www.ishouldbemoppingthefloor.com/2012/02/mop-it-up-mondays-3.html. Feel free to stop by and link up some more fabulousness if you get a chance! Awwww, thank you all so much!! Kristi, what an honor to be your feature this week!!! These are really cute. I’ll have to file this idea away for future birthday parties. These turned out super cute!!!! Thanks for sharing it with Six Sister’s Stuff Link Party. We hope to see you back next Saturday! Amee, thanks so much for this idea. I looked for other recipes, but they said to cut 2 inches off the top of the cone — a dangerous proposition, I think, because I can just see every one of them crumbling. I’m glad you found a creative way to use the whole cone. We will be having these for my daughter’s 5th Circus Birthday Party! So glad you love them!! My best tip with making these cupcakes is to assemble them as close as possible to the serving time. I have assembled them in advance and covered them and the cones can get soft and crack. If you assemble the day of serving. They stay perfect!